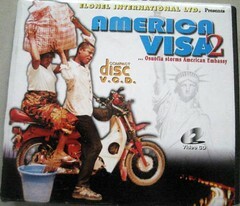 In this Nollywood Comedy America as idealised as the Promised Land, and the imagery throughout is biblical. Linda persuades Tutus to give her money by playing to the imagery that he has of America as a heaven. Chief Titus, played by Nkem Owoh is Linda’s mugu. He spends an extortionate amount of money on her trivial expenses but neglects his own immediate family in times of need. Linda (Anita Hogan) sees that the money appears to be limitless and also the fact that he keeps it all in his house and not a bank and decides to set him up. She gets two of her friends to approach him with the idea of a 3some and of course he is all for it. They go to his house and get comfortable in the bedroom. It is then that they have an army officer burst in and pretend to be one of the girl’s husbands. He is forced to “settle” the officer, and the army crew depart with a large chunk of his money. Titus is now left with one girl, only to have police officers burst in his house shortly after. One of them pretends to be the other girl’s husband and of course he has to be “settled” too. The police officer makes away with the rest of the money and Titus is left broke and womanless. Titus is thrown into poverty and begins work as an okada driver after escaping from the hospital for where he was being held for not paying his bills. I would recommend this movie. Overall I enjoyed the film very much; it was funny and in the end Chief Titus got what he deserved. This film teaches us that what goes around comes around. He neglected his family in the name of lust only to be cheated by this same woman.